Heights of The Legendary Royal Enfield BULLET ! 1. 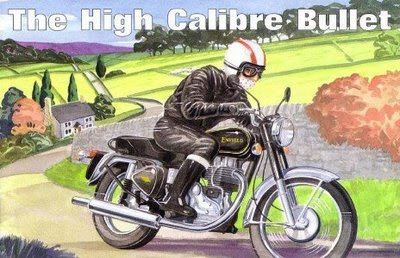 If any motorbike has 5 litres petrol and a BULLET has 5 litres petrol,the BULLET has more Petrol than the other bike. 2. There is no theory of motorbike revolution. Just a list of jap-crap that the BULLET has allowed to live. 3. BULLET is the reason, Tata's after buying Jaguar are still afraid to enter the motorbike segment. 4. When a BULLET moves forward, it is not moving.It is pushing the Earth backwards. 5. If you Google search "BULLET bad bike" you will generate zero results. It just doesn't happen. 6. Contrary to popular belief, the Titanic didn't hit an iceberg. The ship was off course and accidentally ran into a BULLET which was thumping some sea waves! 8. There are only two things that can cut diamonds: other diamonds, and BULLET. 9. The BULLET can go around the earth so fast, that it's headlights can read its rear numberplate in one throttle. 10. Riding Bullets on Beachsides has been banned. The tsunamis were killing people. 11. The 11th commandment is “Thou shalt not piss off the Royal Enfield BULLET” This commandment is rarely enforced, as it is impossible to accomplish. 12. The RE Bullet is "The best a man can get"